Why is goal planning important? Well the reason is simple, human beings are goal directed creatures constantly striving for meaning, significance and purpose. Having a goal, something to work towards, gives us a sense of value and control. A life devoid of achievable goals can result in stress and tension. However, not only can stress arise from an absence of goals, but equally having too many goals or conflicting goals can be a source of stress. Creating our own goals can be very satisfying and rewarding, but when we are forced to work towards someone else’s goals this can be problematic, not only can it cause underlying tension, but it can be wholly unsatisfying. How many reading this will be thinking about work, going for goals they don’t believe in and wouldn’t set themselves? Many I dare say. In essence, your goals should help you to give direction to your life. But before you set yourself goals, you need to decide what you want. Take some time to visualise, dream and imagine what it will be like to achieve your goals. Merely the task of setting and working towards goals, increases motivation and energy. The most successful people in life have one thing in common, they work towards goals. Why don’t people set goals? There can be many reasons why people do not set goals. Sometimes it’s because they don’t think it is important. Sometimes it’s because they don’t know how to. Sometimes people don’t set goals because they fear they will fail. Having identified a goal, the next thing is to write it down on paper or in your diary. This makes it visible and it can symbolise readiness for action. Writing down your goals also stops you “putting it off,” as it is easy to “drift” through life without clear goals. Need a little help in goal planning? I dare say, some reading this might think yes, I would like to set some goals but I really don’t know how exactly to go about it. Begin by separating your life into different areas. Now let your imagination go free. Decide what it is you really want. A. I wish to work with animals. B. I would like to have some new friends. C. I would like to be the fastest swimmer in London. Consider how realistic these goals are? Do any of the goals listed need changing? How achievable are these goals? Why is C unrealistic? Now write your goals into an action plan. Write your goals in clear, measurable language as a series of achievable steps. By Friday I will have found out where the local animal rescue centre is. By the following Friday I will have written to them asking if they need any volunteers. By the following Friday I should know if they need volunteers. By Friday I will go to the library and find out what clubs are near me. By the following Friday I will have chosen one to join and will phone up for more details. By the following Friday I will hope to attend and will meet new people. By the following Friday I may have made some new friends there. For (my amended and now realistic) goal C.
New goal = To be able to swim three lengths of the local swimming pool. By next Friday I hope to have gone swimming twice. Going twice weekly I will aim to swim one width in two weeks time. My goal is to be able to swim one length in one month. I aim to reach my target goal within one month. What may cause my plans to go wrong? The swimming pool only allows people to swim lengths on Tuesdays and Thursdays – I will have to make sure I go on these days if I want to reach my goal. If I have completed my goals by Christmas I will buy myself a new music system. I picture myself fitter, slimmer and enjoying my new music system, having made new friends at a local club and at the animal sanctuary where I now work. I can easily swim two lengths of the local pool. Ref: Powell.T. (2000). The Mental Health Handbook (Revised). Speechmark publishing. How to prepare for exams – An A-Z of useful tips. Taking exams is bound to be stressful because of what’s at stake. You may be feeling a weight of expectation from your family, school, university or workplace to succeed. You may be afraid you’re not good enough, or haven’t worked hard enough. You may be scared of letting yourself down, or that you’ll miss out on a job, university place or career move. If your stress levels rise too high for too long, it can be harmful both to you and to your chances. Controlled at the right level, however, stress can work to your advantage, because it can help you to produce your peak performance. Stress responses can differ between males and females. Research shows that when females experience exam stress they show internal symptoms and responses such as nausea, butterflies, and feelings of inadequacy which can lead to sadness and depression. Males tend to externalise their anxiety and they can become increasing irritable or feel angry. Aaron Beck, the father of Cognitive Therapy, said “It is not events per se which determine our feelings but the meanings that we attach to these events”. Do you view your final assignment as an opportunity to show what you know. Do you view the exam as a welcome challenge? Anxiety cue word– Self-controlled relaxation and desensitisation are effective treatments used to decrease emotional/physiological responses to exam stress. Use the onset of anxiety as a cue to remind you to relax instead of leaving or letting your mind close down. Repeat in your mind a cue word such as ‘calm’ each time you breathe out. Repetition of this cue word brings relaxation and relieves anxiety. Affirmations – Reassure yourself. Remember to view the exam as an opportunity to show what you know instead of as a threat of failure. I will pass the test. I will focus on one question at a time. Breathing techniques– Deep relaxation practice and meditation can help to induce a state of calm and reduce some of the unpleasant physical sensations that accompany anxiety (Remember diaphragmatic breathing). planning more and showing persistence when study demands increase. Concentration-If you have a problem with concentration, you can improve it by starting with short bursts of study, then adding an extra few minutes to each session. Don’t try to study for longer than 45 to 60 minutes at a stretch. Steer clear of any exam ‘post-mortem’. It doesn’t matter what your mate wrote for Question 3(b). It’s too late to go back and change your answers, so it will just make you worry even more. feelings of inadequacy which can lead to sadness and depression. Expectations – External pressures around final assignments and exams can be huge. The need to get high grades to get on track for the career you really want. It can be hard to deal with, especially with family and people you respect, but you need to remember that it’s your life and your exam, with you in control. Constantly Reminding Yourself What’s At Stake. While remembering the importance of a test’s outcome can be a good motivator for studying, too much focus on the outcome can backfire. If you’re the type of person who is already pretty conscientious, and the idea of doing poorly on the test is starting to cause significant test anxiety, it may be time to shift your focus. This is because being overly anxious about a test’s outcome can actually cause you to do poorly, or to score lower than you normally would. To avoid obsessing, try some positive affirmations or visualizations. Fight & Flight response- The way our body reacts to stress-Look up on internet for more detailed explanation and to fully appreciate the impact on your body. Goals- Set up realistic study goals. Don’t make unrealistic goals If you believe that anything less than top marks is a failure on your part, then you are creating yourself loads of unnecessary stress. Set your self a target that you feel is realistically achievable. Don’t try to be perfect. It’s great to succeed and reach for the stars. But keep things in balance. If you think that “anything less than A+ means I’ve failed” then you are creating mountains of unnecessary stress for yourself. Aim to do your best but recognise that none of us can be perfect all of the time. Information overload– Studying at every available opportunity can lead to information overload. Psychologists suggest that you set yourself a program and stick to it as much as possible. Studying for 20 minutes at a time, followed by a ‘reflection period’ on what you have learned and then a 10 minute break – is ideal for optimum learning. Judgement– Don’t spend too much time analysing your performance after the examination, this almost inevitably leads to since we all focus more on what we have done wrong, than what we have done correctly. While it seems like a great idea to get together and study with your friends, if you’re not careful you may find yourself wasting valuable study time accomplishing nothing but some muted fun. With the wrong mix of people, group studying can turn into a gossip session. Motivation– If you find it hard getting motivated, set yourself measurable goals for each revision session, and tick them off when you’ve achieved them. After each session, acknowledge the achievement, and reward yourself with something. Imagine a bubble around your negative thought. Shrink the bubble in your mind as small as you can. Imagine blowing the bubble to the farthest end of the universe. See and feel it disappearing. Refocus on the exam in front of you and the next question. Organization-Find out what you are facing- work out a plan then you’ll feel more in control. Find out exactly how you will be examined and are their key areas that come up every year. See if you can get hold of past papers. When planning your activities, be sure you allow yourself the time you need to study and get work done. You may require more time than you realize at first, so it’s best to over-estimate when it comes to study hours, so you don’t have to pull all-nighters and end up paying for it the next few days. Patterns of thinking –While certain patterns of thinking cause us to feel anxious The reverse is also true – anxiety influences the way we think. There is a fellow student we fancy..we feel anxious talking to. The result= we find it more difficult than usual to converse. The same is true of exams.. We feel anxious, turn over paper Suddenly blank This is Normal..(Brain freeze) Close your eyes. count to ten (frontal brain).. Focus then read slowly. Procrastinating– It may be less stressful to do the work than it is to worry about it. Procrastination is the thief of time and after years of study you’ve probably got it down to an art form. With the spectre of exam deadlines on the horizon you may fear you’ve cut it fine and have messed up because time is short. It’s amazing what you can get done in a short space of time. The first thing is not to panic. Calm down, take a seat and think about what needs to be done. Most importantly, don’t let anxiety monopolise the remaining time you have. Your main enemy at the moment is panic, especially if you think you’ve left it too late. But the longer you leave it, the harder it’ll be to start. Quick fixes– . Too much high-fat, high-sugar and high-caffeine food and drink, such as cola, chips, burgers and chocolate, can make studying harder. Many people find that eating these foods makes them irritable, hyperactive and moody. Eating foods such as chocolate bars before an exam might give you an energy boost to begin with but your blood sugar levels will drop within an hour and your energy will plunge dramatically, making it hard for you to concentrate. Try dates, nuts (contain mood boosting Thiacin) fruit – eat little and often this keeps blood sugar level. Relaxation- Practice relaxation exercises. Try this – lie on your bed or sit in a comfortable chair. Close your eyes and relax every muscle in your body – starting with the feet and working your way up to your head. Then, imagine yourself walking down the steps from a balcony – into a lovely garden. Bring all your senses into play, your vision, smell, taste, hearing and touch, for example, smelling the roses and hearing the birds, tasting the sweet morning air and touching the petals of a flower. Let yourself remain in this state for a few minutes before opening your eyes, take a deep breath – and come back to the room. Revising– There is no right way to study, try multiple choice, reading out loud, mind maps, short answer questions, essays – vary your study methods this will enable you hold your interest and to process information as the mind does so differently, verbal and non verbal memory are situated in different parts of the brain (L & R hippocampus). Try singing. Writing endless notes, mindlessly, is probably a waste of time. You would do better to write down key aspects, actively question what you are reading, maybe, discussing with someone who knows the subject well. Don’t try to revise for too long in one day, especially as exams draw nearer. Try to avoid revising late at night. Work on your most difficult subjects during your ‘peak’ periods. For some this is usually between 10 am and 12 noon, and 3 pm and 4.30 pm. Look again at your living space, be sure there’s a quiet space for you to focus and concentrate. If your room-mate is noisy or ever-present, that may mean finding a favourite nook in the library or elsewhere to frequent. Otherwise, set up a nice study area for yourself where you can keep everything you need, focus, and get things done. Thought replacement strategies – you are the one in charge of your thoughts and you can control your thoughts. Interrupt them and challenge them. Actively change negative (self-defeating) thoughts to positive (self-enhancing) ones. Practice thought replacement prior to the exam, during the exam and after the exam. Develop the ability to refocus your attention should it drift during an exam. Timetable-plan a revision timetable as early as you can, remember to keep it flexible and realistic. Link it to your exam timetable so that you revise subjects in the right order, pacing yourself and expending energy appropriately. Try to balance your timetable with other activities, e.g., sleep, eating, chores and time to relax. Schedule regular breaks, and do take them. Make breaks longer as the day goes on. Remember that most people can only concentrate fully for about 45 minutes at a time. Unwind – Have some down time, take break between sessions, or if you find things getting on top of you. Get a soft drink, read a magazine or take some exercise. Try to make time for yourself away from study to wind down. For example relaxing in a warm bubble bath, listening to soothing music and shutting out the world for a while. 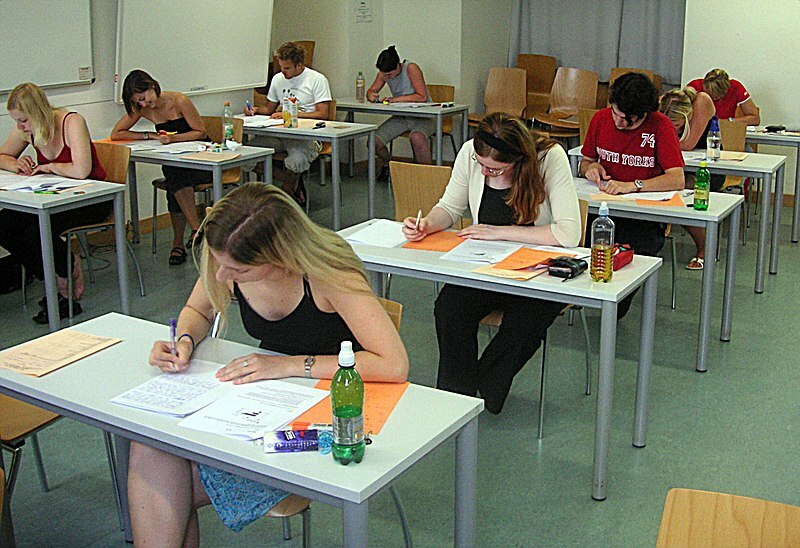 Visualisation– Close your eyes and imagine the classroom during the exam. Image yourself doing well. Envision applying stress reduction techniques as you are taking the exam. Build confidence by believing in yourself and your abilities. See yourself doing well on the test. Wandering mind– If you find your mind begins to wander during your studies then it’s time for a rest. There’s no point in continuing at this time with your learning because your brain won’t absorb the information as easily as it would if you were at your peak. X is for Exercise– (I never was good at spelling!) Is the best way to work off stress. Exercise to burn off excess adrenaline and help with sleep. Exercise boosts endorphins promoting a good mood. Be in the routine of working some of the time and then going to the gym or for a run. Yoga– Treat your body to a few new postures! Hanging upside down increases the flow of fresh blood through brain cells, improves lymph drainage , is good for thyroid. ZZZ’s – If you’re tired, worries can get blown out of proportion. If you’ve been finding it difficult to get to sleep, try cutting down on stimulants (tea, coffee and alcohol, for instance) and make sure you have time to unwind before bed. A warm bath, with perhaps some added aromatherapy oils, can help. Some people feel very stressed about not getting enough sleep. It’s worth remembering that people can still function very well without any sleep for short periods of time. Final note: There’s a good quote that goes, “the more I practised, the luckier I got”.